If you were early on the whole Bitcoin mining thing and were one of the first adopters of the Bitcoin ASIC miners when they started appearing you may still have some devices lying around that are generally not worth using anymore for mining. Well, maybe you just thought that they are not good for anything anymore, but there could still be some use for them, or at least if you want to test your luck “playing the lottery” for Bitcoin. The concept of Bitcoin lottery device was used along the announcement of the TechnoBit DICE Bitcoin ASIC miner, probably something that the marketing at Spondoolies Tech came up with as they are the actual manufacturer of the ASIC chips used inside the device. But aside from the DICE the concept to solo mine testing your luck to hit a BTC block yourself with a Bitcoin ASIC miner that is unprofitable if you mine at a pool sharing the profit with other miners might actually not be a bad one. It is risky and the chances are not that high thus the lottery reference – you may need a few months or an year and still get no block solved, but if you are lucky and manage to hit one, then you will get 25 BTC as a reward. Depending on the ASIC miner you are going to be using your chances might be better than actually playing the lottery, so you might want to give this idea a go. The drawback that the use of an older and low hashrate Bitcoin ASIC miner as a “lottery device” is that you need to have a system that is always on and running a Bitcoin node, so that you can point your miner at it. Also setting up solo mining operation at home might not be the easiest thing for everyone, though if you already have and used Bitcoin ASIC miners you most likely should be able to do it. There is an alternative however, you can use a solo mining pool such as TBDice that was apparently prepared for DICE miners, but you can join in with any their miner as well. 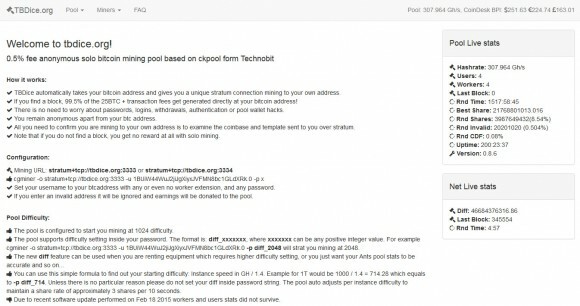 The idea of this pool is that you get to mine with the added convenience of a mining pool, but if you solve a Bitcoin block you will still get the full reward minus a small fee. Then again you may also decide to run the mining pool software yourself on your own website or a PC, you can get the CKPOOL source and use it – it is freely available. 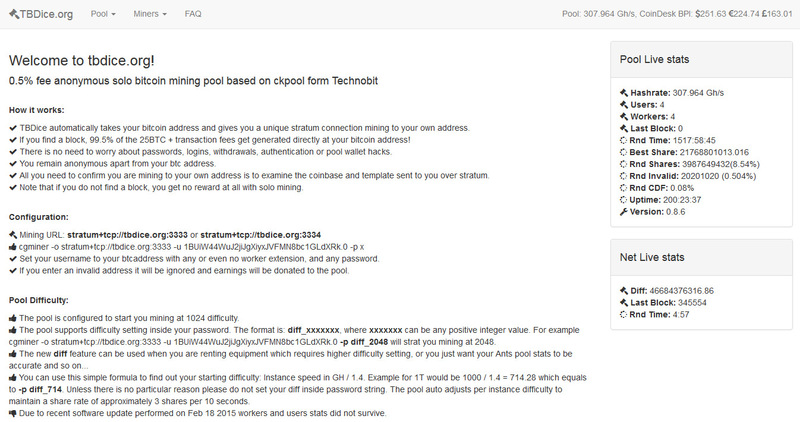 Do note that CKPOOL is designed to be used as a Bitcoin mining pool, but the concept of using your mining hardware as a lottery device applies to pretty much all other crypto coins as well, so you can test it with Litecoin for example or any other altcoin.